From the peaks to the streets, the Empire Lara is at home anywhere. Designed by Hiromi Takahashi for female rippers, this premium boot features clean lines and a classic asymmetrical design. Embrace the Empire. 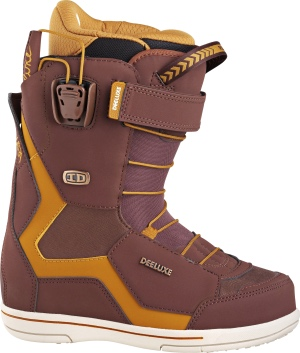 Bootfitter’s comments: Top-end ladies’ boot from Deeluxe, the Empire Lara is designed to rip all over the mountain. Fully heat mouldable liner delivers custom fit and lasting hold! Female-driven and park proven, the ID Lara blends crisp style with fresh technology. And despite its stealth appearance, the boot’s comfort and performance are immediately evident. Get ready to hide these from your friends. Bootfitter’s comments: All-day everyday performance from Deeluxe. Not as stiff as the Empire, but still fully heat mouldable, the ID 6.2 is a great bet for advanced all-mountain riders. Although the Ray Lara is at home on the runway, it prefers the slopes. With its classic styling and sophisticated features, this flagship boot blends beauty and performance. The Ray Lara is perfect for making turns and turning heads. Bootfitter’s comments: A soft flex and custom liner offer all-day comfort for the intermediate rider. Built thought for whatever the mountain throws at you! High-end materials matched with our top tier technology combine in the Contour boot. With a medium flex for go anywhere versatility and the fit-on-the-fly adjustability of the Boa® Conda system, the Contour is the long lasting comfortable choice of our K2 Women’s’ Alliance team. Bootfitter’s comments: Performance and versatility in K2’s top women’s boot. For advanced riders looking to charge the whole mountain. With the ease of Boa® and the heel hold abilities of Conda™ wrapped in rich materials and style, the Sapera is tough to beat. Rocking custom moldable Intuition liners and lightweight phylon outsole the Sapera matches fit with comfort, warmth and ease. This snowboard boot will keep the comfortable goodtimes rolling until last chair and beyond. Bootfitter’s comments: Simple adjustability, custom liners and light weight ensure the Sapera is a best-selling choice for those looking to match comfort and performance. A safe Haven for all women placing emphasis on comfort and simplicity. Boa® lacing system makes getting laced up and ready to ride easier than ever, while Intuition custom moldable foam provides a soft, comfy feel that won’t breakdown over time. Bootfitter’s comments: Simple, soft and comfortable, the Haven is a great option as a first boot for those looking to take their riding to the next level. 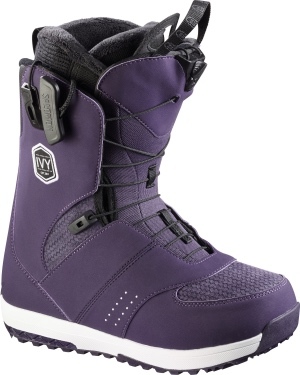 Ride to the beat of your own drum with the customizable Cadence women's snowboard boot. Featuring the ladies specific C.A.T. adjustment, Boa® Focus lacing and heat-moldable Intuition™ liner for a precisely perfect fit. Providing the ideal blend of freestyle mobility and lightweight goodness, this stylin’ high-end boot also features the ultra-premium Michelin® Peak Sole outsole and supportive Impacto™ insole. Bootfitter’s comments: Premium performance all over the mountain from Ride. The Cadence features a snugger heel hold, and an Intuition liner for a locked-in, responsive feel. The Hera snowboard boots don’t only exist in myth or legend; the new divine boot brings reality to a perfectly precise fit and comfort. Featuring the Tongue Tied™ Boa® closure system for award-winning heel hold, the easy-to-use Boa® coiler, and supportive Intuition™ liner for a superior fit right out of the gate. Add in our top quality custom calf adjust for ladies, and you get the easiest, most comfortable freestyle mountain snowboard boot around. 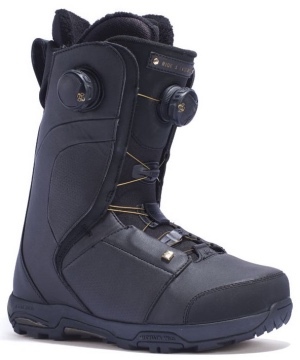 Bootfitter’s comments: Lightwieght, adjustable and versatile boot for intermediate to advanced snowboarders looking for all-mountain freestyle performance. Designed for ladies looking to step up their game, Ride Snowboards’ Sage includes a heat-moldable Intuition™ Plush liner, while providing the ultimate in cush comfort, support, and warmth. Featuring the Boa® Coiler lacing system with the Closer™ lace guide, the Sage snowboard boot is built for high-level comfort that allows the focus to remain on what’s really important: enjoying the Ride! Bootfitter’s comments: Our entry-level offering from Ride, the Sage is a comfortable, supportive, no-nonsense boot for those getting serious about their snowboarding! The Moxie Snowboard Boot is packed full of technology, and now features a brand new Ortholite C3 insole with dual density memory foam plus an EVA heelcup for supreme comfort. The women’s specific HALO Liner ensures warmth all over, and PowerLock Pro Lacing coupled with the STR8JKT ankle harness delivers support and maximum heel-hold. The Moxie brings first class comfort, cutting edge design, and lasting warmth to the hill, so you can get into the air and log those frequent flyer miles. Bootfitter’s comments: All-mountain performance from Salomon in a snug-fitting, durable package. If you’re a serious rider looking for maximum heel hold and response, the Moxie should be on your radar. Where fashion collides with function, the Kiana Snowboard Boot is loaded with technology designed to keep you feeling comfy and warm for freestyle prowess. The all-new memory foam Ortholite C2 insole ensures comfy toes, while a 45-degree flex zone and supportive backbone deliver season after season durability. Add in ZoneLock Lacing and a Halo Liner, and who knew looking good could feel this good? Bootfitter’s comments: Versatile, smooth and comfortable, the Kiana offers great adjustability and support for intermediate to advanced riders who need a slightly snugger fit in their boots. Your feet deserve to be happy and the Ivy Snowboard Boot is here to help make sure they are! Featuring the all-new memory foam Ortholite C2 insole for top-notch coziness, with ZoneLock Lacing for unmatched hold. The Ivy is designed to secure your feet with cushiony comfort from first to last lap. Bootfitter’s comments: Lightweight, comfortable and built with Salomon’s legendary durability, the Ivy is a bestselling boot for anyone looking to progress their riding. The Lunar Hybrid Coiler is here to take your level of riding to new heights. This women’s specific boot features a mid flexing feel that allows for the needed movement in all riding conditions and the comfort you would expect in a high-end boot. This boot also boosts a BOA COILER closure system along with a HeelLock QuikFit pull for extra heel hold down. Our 4 Feather moisture wicking liner with Ripper Lacing and internal harness is sure to support at any level. The B.F.T. CONTACT outsole, designed in collaboration with Vibram®, also adds to this total performance package. Bootfitter’s comments: Top-end ladies’ performance boot from Flow. The Lunar features a medium flex, precise lining and intuitive dual lacing system to take your riding to the next level. Making sure you have the lightest boot going will ensure an insane day on the hill, regardless of what you prefer to ride. The DeeLite is just that boot, with women specific features and dimensions, comfort has never felt this good. The BOA Coiler Closure System is simple to use and will ensure a great fit and a great day on the hill. Being paired with our 3 Feather lightweight liner to give you all day performance with the broke-in feel right out of the box. This boot also features our B.F.T. FREE-TRACK outsole that adds great function to this total performance package. Bootfitter’s comments: The Deelite is built to be so light and comfortable that you forget you are wearing them. Medium-soft flex will suit freestylers and improving riders looking to tackle the whole mountain. Luxury is now available in a snowboard boot. K2 Estate boots are premium real estate for your feet, and will keep you comfortable, warm and dry during even the most epic shred sessions. Bootfitter’s comments: Comfortable, cozy and high-performance ladies’ boots from K2. Intuition Spaceheater liner features reflective material around the toes and forefoot to trap heat in and keep you out there riding.